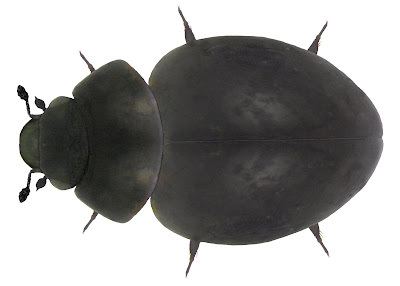 Microsporus obsidianus, copyright Udo Schmidt. The Myxophaga are a group of small, algae-feeding, aquatic or semi-aquatic beetles. Adults respire via a plastron of air trapped by a dense pile of hydrophobic hairs, and contain the wings beneath the elytra by a rolling mechanism. Larvae, where known, possess tracheal gills and pupate within the last larval exuvium. The larval gills are segmented in Torridincolidae and balloon-like in Hydroscaphidae and Microsporus (Grimaldi & Engel 2005). [B74] Britton, E. B. 1974. Coleoptera (beetles). In: CSIRO. The Insects of Australia: A textbook for students and research workers. Supplement 1974 pp. 62–89. Melbourne University Press. [H01] Hall, W. E. 2001. Hydroscaphidae LeConte, 1874. In: Arnett, R. H., Jr & M. C. Thomas (eds) American Beetles vol. 1. Archostemata, Myxophaga, Adephaga, Polyphaga: Staphyliniformia pp. 27–29. CRC Press: Boca Raton. [LM87] Lawrence, J. F., B. P. Moore, J. E. Pyke & T. A. Weir. 1987. Zoological Catalogue of Australia vol. 4. Coleoptera: Archostemata, Myxophaga and Adephaga. Australian Government Publishing Service: Canberra. [P02] Ponomarenko, A. G. 2002. Superorder Scarabaeidea Laicharting, 1781. Order Coleoptera Linné, 1758. The beetles. In: Rasnitsyn, A. P., & D. L. J. Quicke (eds) History of Insects pp. 164–176. Kluwer Academic Publishers: Dordrecht. Last updated: 26 October 2018. The genus name Microsporus (Kolenati 1846) is a junior synonym of Sphaerius (Waltl 1838). Thanks for your comment, Doug. Sphaerius Waltl 1838 was suppressed by the ICZN in 1985 (BZN 42: 230).